Background Traditionally, the initially nondisplaced pediatric humeral lateral condyle fractures were treated conservatively, whereas displaced or rotated fractures were treated by open reduction and internal fixation (ORIF). 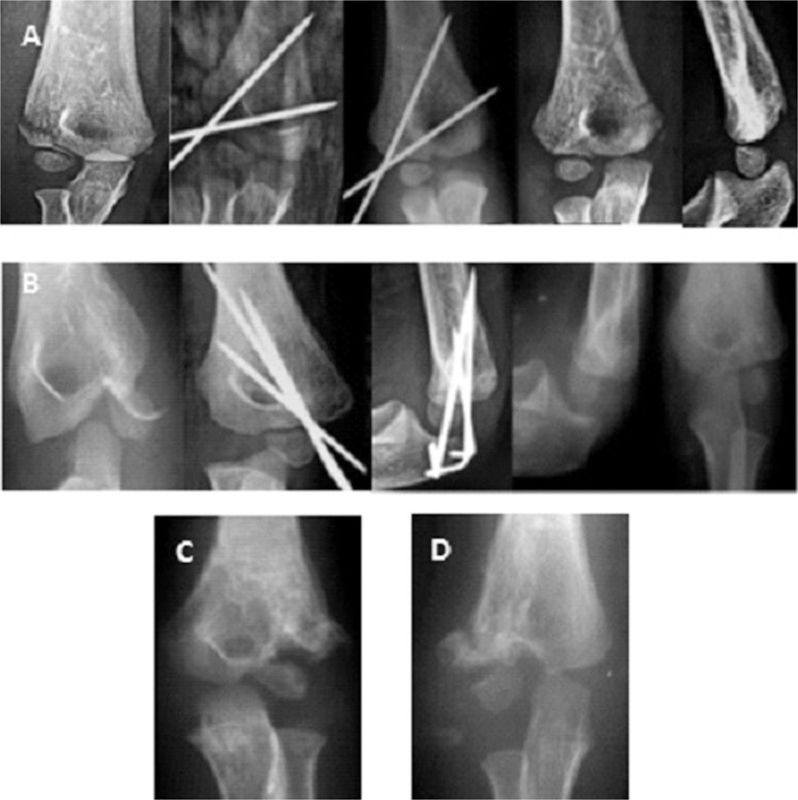 Late displacement and nonunion were reported in some conservatively treated cases, whereas epiphyseal necrosis with or without nonunion and elbow deformity were reported in some cases treated by ORIF. Few studies have highlighted closed reduction and percutaneous fixation (CRPF) of displaced and/or rotated fractures. The aim of this study is to assess the outcome of CRPF for the treatment of pediatric humeral lateral condyle fractures. Patients and methods A prospective study included 45 cases of PHLCFs that were preoperatively classified according to classification by Song and colleagues; all cases were planned to have percutaneous fixation through either in-situ pinning if initially nondisplaced or closed reduction if displaced or rotated. If closed reduction failed, ORIF was done. The functional results were evaluated according to the modified criteria of Aggarwal and colleagues. Results CRPF was successful in 80.48% of cases with displaced and/or rotated fractures, with satisfactory clinical and radiological results and no reported surgery-related complications in any case till the last follow-up, with a mean follow-up duration of 18.6±3.04 months. ORIF was done in only eight cases (representing 19.52% of the studied cases) after failed closed reduction. There was a statistically significant difference (P<0.001) in the mean radiological union time and the mean time needed for restoration of the full functional capacity of the operated elbow between cases treated by CRPF and cases treated by ORIF. Conclusion CRPF could be the treatment of choice for potentially unstable lateral humeral condyle fractures avoiding the complications of late displacement and elbow stiffness reported in some conservatively treated case. CRPF is an efficient and minimally invasive treatment option for some displaced and/or rotated fractures with very satisfactory clinical and radiological results. ORIF could be restricted only for certain complex cases or after the failure of CRPF. Pediatric humeral lateral condyle fractures (PHLCFs) represent 15–17% of elbow fractures and mostly occur in patients aged between 4 and 8 years . Theoretically, these fractures could occur by either a pull-off injury, in which avulsion of the lateral condyle occurs at the origin of the extensor/supinator musculature when a varus stress is applied to the extended elbow with the forearm supinated (the most common mechanism of injury), or a push-off injury, in which a fall onto the extended hand affects the radial head against the lateral condyle, causing the fracture . At a younger age when these injuries typically occur, the distal humerus is primarily cartilaginous and therefore, interpretation of radiographs may be misleading because the visible fragment appears smaller than the actual size and displacement is greater than appreciated and usually associated with articular surface incongruity. Appropriate management requires clear understanding of the relevant anatomy (the secondary ossification centers and blood supply), the different fracture patterns, and possible complications . Fractures with minimal displacement must be carefully monitored when conservatively treated, as they have a high potential for displacement; once these displaced fractures consolidate in a malunited position, treatment is difficult and dangerous with many complications , meanwhile, excessive and vigorous soft tissue dissection during open reduction and internal fixation (ORIF) may lead to nonunion, avascular necrosis of the lateral condylar mass, premature physeal closure, cubitus valgus, and elbow stiffness . 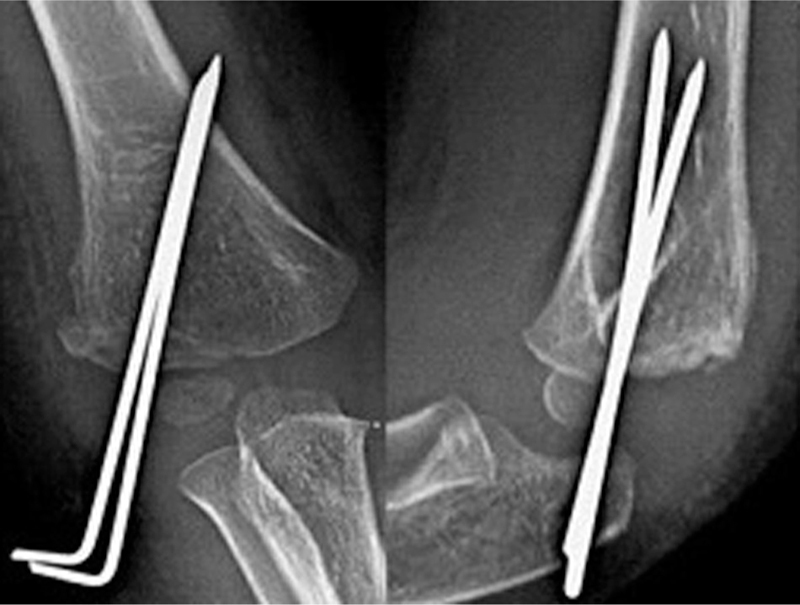 The aim of the current study is to assess the suitability and efficiency (clinically and radiologically) of closed reduction and percutaneous fixation (CRPF) as an option for treating either initially nondisplaced, potentially unstable fractures, or displaced and/or rotated PHLCFs as a midway alternative between the nonoperative treatment and the classic open surgical intervention for such injuries. A prospective case series study was carried out in the Orthopedic Department at Benha University Hospital and Health Insurance Hospital between March 2014 and December 2016, and it included 45 cases of PHLCFs. Cases with PHLCFs presenting within the first 2 weeks of injury whether initially displaced or potentially unstable were included in this study. The study was approved by ethical committee of Benha University and was in accordance with the ethical standards of the institutional and national research committee and with the 1964 Helsinki declaration and its later amendments or comparable ethical standards. All patients’ parents signed an informed consent after clear explanation of the surgical procedure. Patients were clinically evaluated for elbow swelling, neurovascular status, and elbow stability in all directions. Clinical data eventually included the age of the patient, type of trauma, the injury/presentation interval, and the initial management in lately presented cases. Radiological assessment was done using three standard radiographic views (anteroposterior, lateral, and internal oblique views). Fractures were classified preoperatively according to the degree of displacement and the fracture pattern using the classification by Song et al. . They classified these fractures into five stages. In stage 1, the fracture is stable, displacement is less than or equal to 2 mm, and the fracture line is limited to within the metaphysis. In stage 2, displacement is less than or equal to 2 mm, the fracture line extends to the epiphyseal articular cartilage, there is a lateral gap, and the fracture stability is indefinable. In stage 3, the fracture is unstable, displacement is less than or equal to 2 mm, and there is a gap that is as wide laterally as it is medially. In stage 4, the fracture is unstable and displacement is more than 2 mm. In stage 5, the fracture is unstable and displacement is more than 2 mm with rotation. 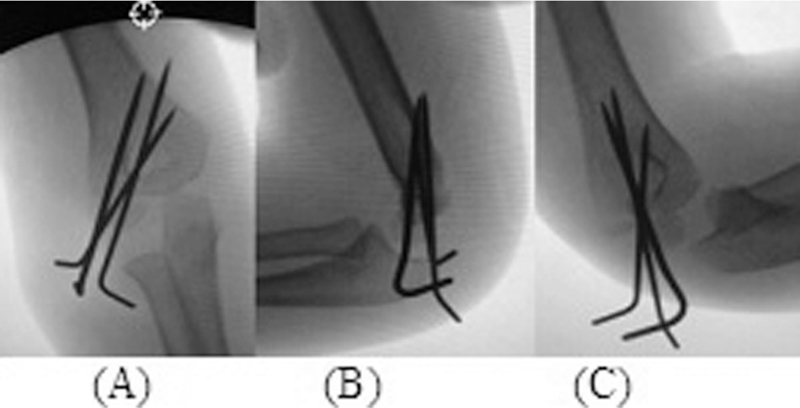 In addition to fracture displacement and fracture line extension, standard anteroposterior views ([Figure 1]) could tell about the relation of the fracture line to the capitellar epiphysis, the orientation of the displaced or rotated fragment either vertically or horizontally, the size of the metaphyseal fragment, and finally, whether the elbow joint itself is subluxated/dislocated or not. We added an extra stage to the classification by Song and colleagues for describing cases of PHLCFs associated with elbow dislocation and was referred to as stage 5+. Figure 1 Standard anteroposterior view of some of the studied cases with different fracture characteristics: (a) An incomplete fracture (not reaching the articular surface) with a lateral gap and ≤2 mm (Song et al. stage 1). (b) A complete fracture reaching the articular surface with a lateral gap and ≤2-mm displacement (Song et al. stage 2). (c) A complete fracture with a >2 mm displacement (Song et al. stage 4). (d) A complete fracture with a displaced and rotated fragment (Song et al. stage 5). (e) A complete fracture with a displaced and rotated fragment with elbow dislocation (considered stage 5+). Internal oblique view radiographs ([Figure 2]) can sharply determine the size of the metaphyseal fragment and tell whether a minimally displaced fracture is stable or potentially unstable depending on the extension of the fracture line to the joint surface. Cases with fractures that started laterally in the metaphysis and extended to reach the articular surface in both the anteroposterior and internal oblique view radiographs − whether displaced or not − were considered potentially unstable and were considered as candidates for fixation and included in this study. Figure 2 Internal oblique view radiograph of some of the studied cases with different fracture characteristics: (a) an incomplete fracture with the fracture line not reaching the articular surface. (b) A complete fracture with a nondisplaced fragment with a large metaphyseal segment. (c) A complete fracture with a nondisplaced fragment with a small metaphyseal segment. (d) A complete fracture with a displaced fragment with a small metaphyseal segment. Lateral view radiographs were of little value in evaluation of such fractures at presentation but they were critically important (combined with the internal oblique view radiograph) for assessing the achieved reduction ([Figure 3]a) and evaluation of union progression during the follow-up and could tell about the proper time of wires removal after proper healing with complete disappearance of the fracture line ([Figure 3]b). All the studied cases were planned to have either in-situ pinning or CRPF with a minimum of two Kirschner (K)-wires under C-arm guidance. Under general anesthesia and without tourniquet, in-situ pinning was done for nondisplaced, potentially unstable cases, whereas reduction of the displaced fragments was tried by applying traction and varus stress with gentle pressure manipulating the displaced fragment from its posterior and lateral borders directing it anteromedially toward its bed with reduction to near-anatomical position as much as possible. Reduction assessment was done using C-arm in three views (anteroposterior, lateral, and internal oblique views) and then the reduced fragment was fixed percutaneously using at least two K-wires engaging the medial or the posterior cortex ([Figure 4]). Figure 4 Intraoperative C-arm images corresponding to the case presented in [Figure 1]c, showing fixation after achieving accepted reduction in all the three views with no articular step and a fracture gap less than 2 mm: (a) An anteroposterior view radiograph showing near-anatomical reduction with good distribution of the transfixing Kirschner-wires. (b) A lateral view radiograph showing near-anatomical reduction with good engagement of the distal fragment. (c) An internal oblique view showing near-anatomical reduction. Displaced and rotated fragments were reduced with the same technique with the aid of another K-wire used as a joystick facilitating manipulation of the fractured fragment, and once reduced to an accepted position, fixed to its bed as usual. If closed reduction failed to achieve an accepted position, ORIF was done. Fixation was protected in above-the-elbow POP back splint for 2–3 weeks − depending on the patient’s age, intraoperative stability, and the early appearance of progressive healing without any eventual displacement that could be detected radiologically in the 2-week interval follow-up. Back splint was removed once dependable healing was detected, allowing early passive and active range of motion (ROM), and then K-wires were safely removed once secure radiological union achieved; the results were reported in anteroposterior and lateral view radiographs ([Figure 5]). Figure 5 Five-week postoperative radiographs corresponding to the case presented in [Figure 2]c, showing complete healing of the fracture. Excellent: Union in perfect alignment with a full ROM at the elbow, without any change in carrying angle, without avascular necrosis/lateral prominence/premature fusion of physis. Radiograph shows a perfect reduction. Good: Union with minimum displacement, limitation of terminal range of movements of not more than 15°, no alteration in carrying angle, no premature fusion of the physis, no avascular necrosis, no local deformity, and radiograph showing a step/gap of not more than 2 mm. Fair: Union with minimum displacement, limitation of terminal range of movements of not more than 25°, alteration in carrying angle of up to 10°, premature fusion of the physis, no avascular necrosis, mild local deformity, and radiograph showing a step/gap of 2–5 mm. Poor: Nonunion at the fracture site, gross limitation of elbow movements, alteration in carrying angle of more than 10°, premature fusion of the physis, avascular necrosis of the fragment, visible deformity at local site, and radiograph showing a step/gap of more than 5 mm. Statistical analysis was performed using SPSS, version 19.0 (SPSS Inc., Chicago, Illinois, USA). Statistical analysis was done using a two-tailed Student’s t-test, and P value less than 0.05 was considered statistically significant. A total of 45 cases of PHLCFs in 45 patients (36 males and nine female patients) were included in this study, and the age of the patients ranged from 4.5 to 11 years, with a mean age of 6.5±1.5 years. The right side was affected in 28 cases whereas the left side was affected in the remaining 17 cases. The injury/surgery interval ranged from 1 to 12 days with a mean duration of 4.6±3.7 days, and cases were followed-up for 14 to 26 months postoperatively with a mean duration of 18.6±3.04 months. According to classification by Song et al. , four cases were stage 1 fractures, six cases were stage 2 fractures, 15 cases were stage 4 fractures, 17 cases were stage 5 fractures, and the last three cases were displaced and rotated fractures associated with elbow dislocation and were considered stage 5+ fractures. According to Song et al. , the reduction was considered acceptable, and closed pinning could be done when confirmed to be within 2 mm displacement or step-off especially on the internal oblique view, whereas cases in which fragments could not be reduced to within 2 mm, ORIF was done. In this study, in-situ pinning was done in all the four cases with stage 1 fractures, and closed reduction by direct thumb pressure and percutaneous fixation (CRPF) was done in the six cases with stage 2 fractures (representing 100% of such cases). Of the 15 cases with stage 4 fractures, 14 (representing 93.33% of such cases) were successfully treated by CRPF, whereas one case (representing 6.67% of such cases) needed ORIF. Of the 17 cases with stage 5 fractures, 11 (representing 64.70% of such cases) were successfully treated by CRPF, whereas six cases (representing 35.30% of such cases) needed ORIF. CRPF was successful in two (representing 66.67% of such cases) of the three cases with fracture dislocation (stage 5+ fractures), whereas one case (representing 33.34% of such cases) needed ORIF ([Figure 6]). 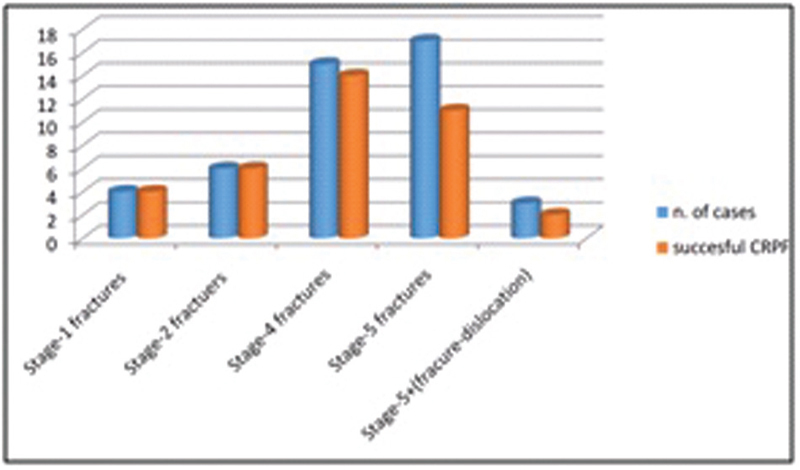 Figure 6 Distribution of the studied cases according to fracture stage using the classification by Song et al. with the number of cases in which closed reduction and percutaneous fixation (CRPF) was successful in each group of cases. In-situ pinning − without reduction − was done in four cases. CRPF was successful in 33 (80.48%) of the remaining 41 cases with displaced and/or rotated fractures, with satisfactory radiological results and no late displacement or surgery-related complications reported in any case till the last follow-up. ORIF was done in only eight cases (representing 19.52% of the studied cases) after failure to achieve an accepted reduction in a closed manner. Beside the fracture stage (type), it was found that success of CRPF depends also on the injury/surgery interval and the size of the metaphyseal fragment. Much difficulty and high failure rate of closed reduction were encountered with fractures presented after 7 days of injury and with fractures with small metaphyseal fragments that made manipulation difficult and risky. Regarding the quality of the achieved reduction, an anatomical reduction was achieved in all the eight cases of ORIF after the failure of closed reduction (representing 100% of such cases). Of the 33 cases with successful closed reduction, accepted reduction (excellent and good) was achieved in 30 (90.9%) cases, two (6.06%) cases had a fair reduction with a step of 2–5 mm, and one (3.04%) case had a poor reduction with a gap of more than 5 mm ([Figure 7]). Figure 7 Radiological results of some of the studied cases: (a) Excellent reduction, secure union with no late displacement in a case with a stage 2 fracture treated by closed reduction and percutaneous fixation (CRPF). (b) Excellent reduction, secure union with no late displacement in a case with a stage 5 fracture treated by CRPF. (c) Fair reduction with an articular step of 2–5 mm in a case with a stage 4 fracture treated by CRPF. (d) Poor reduction with a fracture gap of ∼5 mm in a case with a stage 4 treated by CRPF. Union occurred in all cases except one case (representing 2.22% of all the included cases) that developed a stable fibrous nonunion after premature removal of wires depending on a false radiological impression of a secure union in a case with lateral condyle fracture associated with elbow dislocation that was treated by CRPF ([Figure 8]). The mean radiological union time − which was also the mean time for wires removal − in cases treated by CRPF was 28.4±5.5 days (ranged between 21 and 35 days), whereas the mean radiological union time in cases treated by ORIF was 42.8 ±5.7 days (ranged between 35 and 49 days), denoting a highly statistically significant difference (P<0.001). 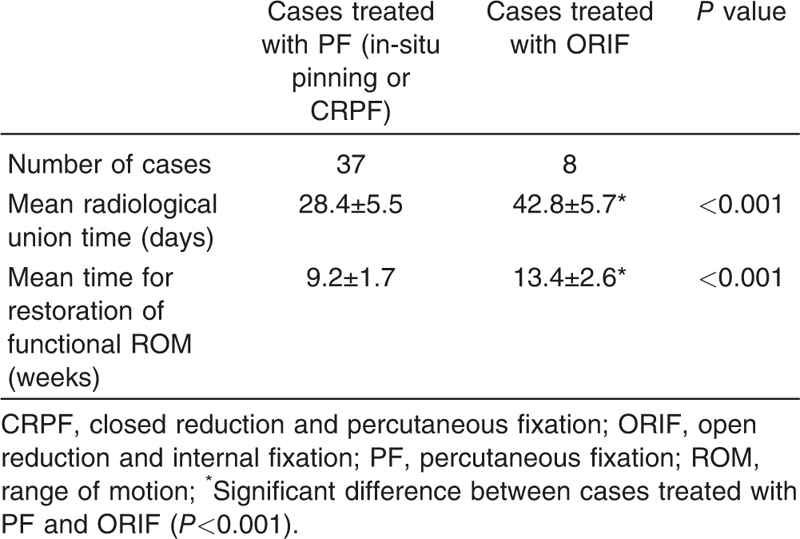 The mean time needed for restoration of the functional ROM of the operated elbow in the cases treated by CRPF was 9.2±1.7 weeks (ranged from 7 and 12 weeks) whereas the mean time in the cases treated by ORIF was 13.4±2.6 weeks (ranged between 10 and 16 weeks), denoting a highly statistically significant difference (P<0.001) ([Table 1]). Figure 8 The final clinical (a) and radiological (b) results after closed reduction and percutaneous fixation of a case with stage 5+ fracture (fracture dislocation) corresponding to the case presented in [Figure 1]e, showing a near-normal range of elbow motion (with only loss of the last 10° of extension and small lateral prominence) in spite of a nonanatomically reduced fragment with a stable fibrous union. In the 10 cases with stages 1 and 2 fractures that were previously considered by most surgeons candidates for conservative treatment in above-the-elbow back splints for 6 weeks, all cases achieved complete healing with no secondary displacement and fast restoration of the functional ROM of the injured joint by the fifth postoperative week. Early restoration of the functional ROM could be attributed to the early passive and active ROM that was allowed as early as the second or the third postoperative weeks after removal of the protective splints with the wires in place. In the last follow-up, 42 cases (representing 93.34% of the studied cases) were functionally excellent, 2 cases (representing 4.44% of the studied cases) were good, and one case (representing 2.22% of the studied cases) was fair according to the modified criteria by Aggarwal and colleagues. In the three cases that were rated as good and fair according to the modified criteria by Aggarwal and colleagues, the radiological results were not typically reflected clinically. The affected elbow joints regained a very accepted functional ROM with a painless stable joint even with the presence of nonanatomical reduction with articular step and/or a fracture gap with a stable fibrous nonunion ([Figure 7]c–d and [Figure 8]). No cases developed superficial or deep wound infection after ORIF, pin-track infection was reported in three cases and was controlled by a short course of oral broad-spectrum antibiotic and pin care using just alcohol while keeping active ROM. Till the last follow-up, no cases developed frank nonunion with a gap, premature fusion of the epiphysis, avascular necrosis of the fragment, or progressive deformity of the operated elbow. PHLCFs are basically an epiphyseal injury; hence, in the long run, it is inherently associated with a potential problem of growth arrest, premature physeal closure, a ROM restriction, and angular deformity of the elbow . These fractures − even when initially minimally displaced − have a high risk for nonunion ([Figure 9]) and/or secondary displacement owing to their intra-articular location and subsequent pull from the common extensor muscles. Figure 9 Although nearly nondisplaced (a) and immobilized for 8 weeks, it went to nonunion (b) that did not heal over the next 1 year. (c) Clinically asymptomatic apart from a loss of the last 5°–10° of extension and lateral prominence. Classically, displaced (>2 mm) and/or rotated fractures had a clear and widely accepted decision for treatment in the form of open surgical treatment (ORIF); meanwhile, controversy is marked when managing nondisplaced or minimally displaced (<2 mm) fractures. Some surgeons advocate nonoperative treatment for minimally displaced (<2 mm) fractures ,,, others recommend open surgical treatment for even minimally displaced fractures in which the fracture line is clear , whereas others still advocate open reduction and fixation for all fractures given the propensity for minimally displaced fractures to become displaced when treated conservatively and to lead to complications when not recognized early . According to the different authors ,,,,, surgeons have three options for treating such cases. The first option is the open surgical treatment (ORIF) for all lateral condyle fractures once the fracture line is clear − even when nondisplaced − given the propensity for nondisplaced or minimally displaced fractures to become displaced when treated conservatively and to lead to complications when not recognized early. The second option is to treat minimally displaced (<2 mm) fractures conservatively with the reported possible risks of late displacement. The last option is to treat minimally displaced (<2 mm) fractures by closed reduction and internal fixation (CRIF). This controversy aroused important questions such as follows: what are the parameters determining the stability of such fractures? Which fractures are actually stable and could be safely treated conservatively and which fractures are potentially unstable and need fixation? Why potentially unstable, nondisplaced fractures should be treated by open surgical treatment if it is possible to fix these fractures safely and efficiently in a closed manner (percutaneously) by either in-situ pinning or by CRPF? Is it always necessary to do an ORIF for all early presented displaced and/or rotated PHLCFs? Rotated fractures, displaced fractures, complete nondisplaced fractures extending from the metaphysis laterally and reaching the articular surface, incomplete fractures with a lateral fracture line that opens producing a lateral gap with varus stress applied to the extended elbow ([Figure 10]) and concealed injuries characterized by massive lateral swelling and crepitus on palpation are potentially unstable fractures and represent clear indications for fixation; either percutaneously or after open reduction. 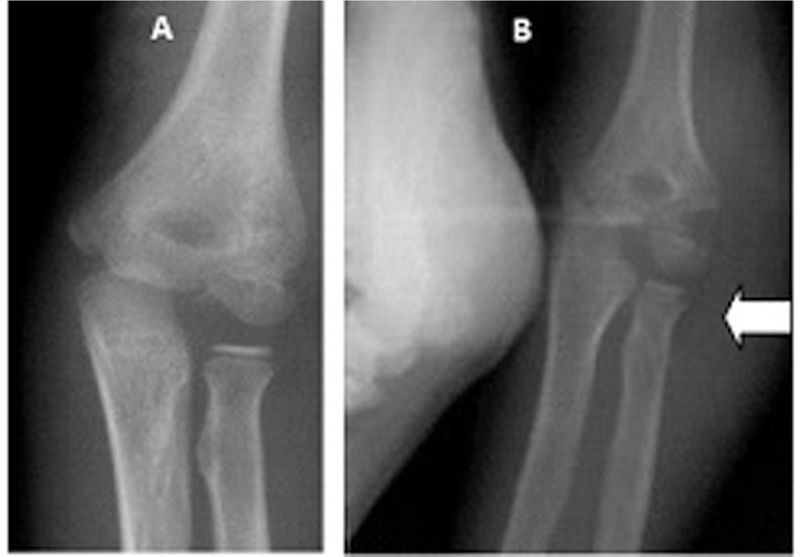 Figure 10 (a) Concealed fracture of the lateral condyle, that became obvious when the elbow was examined under varus stress (b) indicating that the fracture was inherently and potentially unstable with possible late displacement if not properly managed. Traditionally, displaced and/or rotated fractures were treated by ORIF using K-wires of suitable number and diameter according to the age of the patient and the size of the fractured fragment. Meanwhile, few studies presented percutaneous fixation of such fractures for selected cases. Foster et al. used CRIF for nondisplaced or minimally displaced fractures as an alternative treatment for both conservative treatment and open surgical treatment. Mintzer et al. tried CRIF in fractures with 2–4 mm of displacement and used arthrography to document the adequacy of reduction and congruency of the joint. Thomas et al. described percutaneous pin fixation with two divergent pins placed percutaneously after a closed reduction for minimally displaced fractures to maintain the alignment. These studies ,, did not recommend CRIF for rotated fractures. Newly published studies strongly challenged the necessity for the open reduction of a displaced fracture, advocating good results following CRIF of completely displaced and/or rotated fragments ,,. Advocates of closed reduction hypothesize that ORIF might be unnecessary in many cases and that it might even lead to avascular necrosis because of extensive soft tissue dissection ,,. Song et al. presented CRIF for pediatric lateral condyle fractures and reported a success of 73% with no cases of nonunion or malunion. They suggested that CRIF often represents an effective treatment for displaced lateral condyle fractures. Song et al. had only six cases with rotated fractures and reported 50% success rate for doing CRIF. In a subsequent study by Song et al. that included 24 cases with rotated fractures, they reported successful CRIF in 18 cases representing 75% of the studied cases. The progressively increased success rate between the two studies by Song and colleagues , was explained as reported by them by a progressive learning curve and experience accumulation. In this study, CRPF was successful in 80.48% of cases with displaced and/or rotated fractures with satisfactory clinical and radiological results and no reported surgery-related complications till the last follow-up. This study included 17 cases with rotated fractures in which CRPF was successful in 11 of these 17 cases, representing 64.7% of such cases. Compared with the two studies by Song and colleagues ,, the overall superior results (80.48% in this study compared with 73% by Song and colleagues) could be explained by the fact that six minimally displaced cases that were potentially unstable were included in this study, whereas Song et al. managed cases like these conservatively. On the contrary, our results in treating cases with rotated fractures by CRPF were inferior when compared with the results presented by Song et al. when treating such cases (64.70% in this study compared with 75% by Song and colleagues). Compared again with the two studies by Song and colleagues ,, this study included three cases with lateral condyle fractures associated with elbow dislocation representing a more severe entity of such injuries. The direction of dislocation was posteromedial with the fractured lateral condyle still aligned with the radial head in both cases, as described by Eksioglu et al. . Closed reduction was successful in two of the three cases, representing 66.66% of the studied cases. Dislocation of the elbow associated with lateral condylar fractures of the humerus is a rare injury in children, with only a few cases reported in the literature. Although the addition of an elbow joint dislocation would seem to indicate a more severe injury and perhaps a worse outcome, this was not noticed in our study in the two cases treated by CRPF or the case treated by ORIF. Compared with what was reported by Junichi et al. , 2–3 weeks of immobilization was too short a period as they recommended 6 weeks of immobilization, but results regarding immobilization period, union time, and time of wires removal were comparable to other studies, Thomas et al. recommended 21 days of K-wire fixation for displaced lateral condylar fractures of humerus in children. Nasab and Sabahi  found that callus formation was enough to safely remove the K-wires by 30 days after surgery in most of their cases with no subsequent displacement. Boz et al. reported excellent results in 78% and good results in 21.7% of their patients with displaced lateral condylar fracture of the elbow treated by open reduction with 28 days of pin fixation. Gooi et al. found that after ORIF with two K-wires for lateral condyle fractures, the union was seen in 28 days in most of their patients. Cases that were classically treated by ORIF with soft tissue dissection that usually needed longer rehabilitation period for restoration of full ROM of the operated elbow − if fully restored − could be treated with such minimally invasive procedure with no soft tissue violation and marvelous preservation of the precious blood supply to such susceptible growing fragment. Moreover, cases that were traditionally treated conservatively by immobilization for 6 weeks with a possible risk of secondary displacement could be treated with CRPF with no risk of secondary displacement and were immobilized for only 2–3 weeks then started active ROM. Definitely, shorter immobilization period means a faster restoration of the elbow ROM and muscle power. In light of the results of this study and the previous work done by Foster et al. , Mintzer et al. , and Song and colleagues ,, answers to the previously asked questions could be presented. Fractures of the lateral condyle are not the same; fracture line extension and its relation to the capitellar epiphysis, the size of the metaphyseal fragment, the direction of displacement and orientation of the displaced or rotated fragment either vertically or horizontally, and the presence or absence of associated elbow dislocation are different variables producing different types or categories of such injuries. It is not always necessary to do an ORIF for all early presented PHLCFs. CRPF could replace − with superior clinical results − ORIF in most of the cases especially nondisplaced, potentially unstable fractures that were treated traditionally by ORIF. The relatively small number of cases in this study with a relatively short-term follow-up period, the absence of a control group for each fracture stage, the absence of accurate correlation between the injury/surgery interval, and the success or failure of closed reduction and reduction assessment using only image intensifier that could be less accurate in such age group compared with other modalities such as arthrography or MRI represent the limitations of this study; however, these limitations do not undermine the results achieved by this study. CRPF could be the treatment of choice for potentially unstable fractures avoiding the complications of late displacement reported in some conservatively treated case. CRPF is an efficient and minimally invasive treatment option for some displaced and/or rotated fractures with very satisfactory clinical and radiological results. ORIF could be restricted to only certain complex cases or after the failure of CRPF. Beaty JH, Kasser JR. The elbow region: general concepts in the pediatric patient. In: Kasser JR, Beaty JH, editors. Rockwood and Wilkins’ fractures in children. 5th ed. Philadelphia, PA: Lippincott Williams and Wilkins; 2001. pp. 267–806. Lemme K, Lubicky JP, Zeni A, Riley E. Pediatric lateral condyle humeral fractures with and without associated elbow dislocations: a retrospective study. Am J Orthop 2009; 38:453–456. Sullivan JA. Fractures of the lateral condyle of the humerus. J Am Acad Orthop Surg 2006; 14:58–62. Fontanneta P, Mackenzie DA, Rosman M. Missed maluniting and malunited fractures of the lateral humeral condyle in children. J Trauma 1978; 18:329–335. 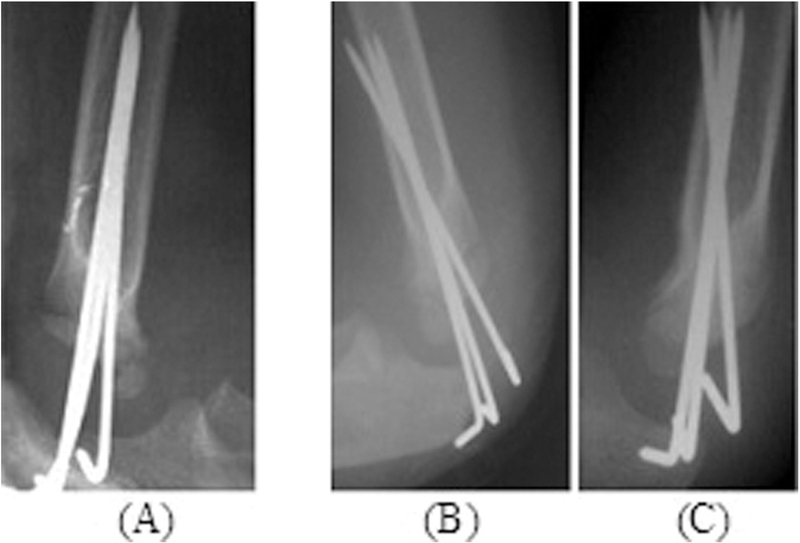 Song KS, Chul K, Byung M, Ki B, Chul C, Ju L. Closed reduction and internal fixation of displaced unstable lateral condylar fractures of the humerus in children. J Bone Joint Surg Am 2008; 90:2673–2681. Agarwal A, Qureshi NA, Gupta N, Verma I, Pandey D. Management of neglected lateral condyle fractures of humerus in children: a retrospective study. Indian J Orthop 2012; 46:698–704. Nishikant K, Anil M, Chandrashekhar Y, Rishi R, Sanjay M, Nilesh B. Delayed presentation of fracture of lateral condyle of humerus in pediatric age group treated by ORIF and ulnar peg grafting: a case series. J Orthop Allied Sci 2015; 3:12–16. Flynn JC, Richards JF Jr, Saltzman RI. Prevention and treatment of nonunion of slightly displaced fractures of the lateral humeral condyle in children. An end-result study. J Bone Joint Surg Am 1975; 57:1087–1092. Mintzer CM, Waters PM, Brown DJ, Kasser JR. Percutaneous pinning in the treatment of displaced lateral condyle fractures. J Pediatr Orthop 1994; 14:462–465. Foster DE, Sullivan JA, Gross RH. Lateral humeral condylar fractures in children. J Pediatr Orthop 1985; 5:16–22. Badelon O, Bensahel H, Mazda K, Vie P. Lateral humeral condylar fractures in children: a report of 47 cases. J Pediatr Orthop 1988; 8:31–34. Jenyo M, Mirdad T. Fractures of the lateral condyle of the humerus in children. East Afr Med J 2001; 78:424–429. Thomas DP, Howard AW, Cole WG, Hedden DM. Three weeks of Kirschner wire fixation for displaced lateral condylar fractures of the humerus in children. J Pediatr Orthop 2001; 21:565–569. Song KS, Shin YW, Oh CW, Bae KC, Cho CH. Closed reduction and internal fixation of completely displaced and rotated lateral condyle fractures of the humerus in children. J Orthop Trauma 2010; 24:434–438. Song KS, Waters PM. Lateral condylar humerus fractures: which ones should we fix? J Pediatr Orthop 2012; 32(Suppl 1):S5–S9. Eksioglu B, Uslu M, Gudemez E, Cetik O. Medial elbow dislocation associated with a fracture of the lateral humeral condyle in a child. Orthopedics 2008; 31:93–97. Junichi T, Julia L, Sameer N, Theodore G, John MF. Pediatric elbow fractures: pearls and pitfalls. Uni Pennsylvania Orthop J 2002; 15:43–51. Nasab SAM, Sabahi S. Assessment outcome of lateral condylar fractures of distal humerus in children treated by open reduction and internal fixation. Pak J Med Sci 2012; 28:617–620. Boz U, Ulusal AE, Vuruskaner H, Aidinoglu Y. Functional results of displaced lateral condyle fractures of the humerus with four week K-wire fixation in children. Acta Orthop Traumatol Turc 2005; 930:193–198. Gooi SG, Chee EK, Wong CL, Mohans R, Khoo EK, Thevarajan K. Retrospective review of Kirschner wire fixation and casting for displaced lateral condylar fracture of the humerus in children. Malaysian Orthop J 2008; 2:17–20.